Best purchase you can make for a Cruze, second only to gasoline. I am very satisfied with the Trifecta Tune. The install was easy and it does what the say it will do. 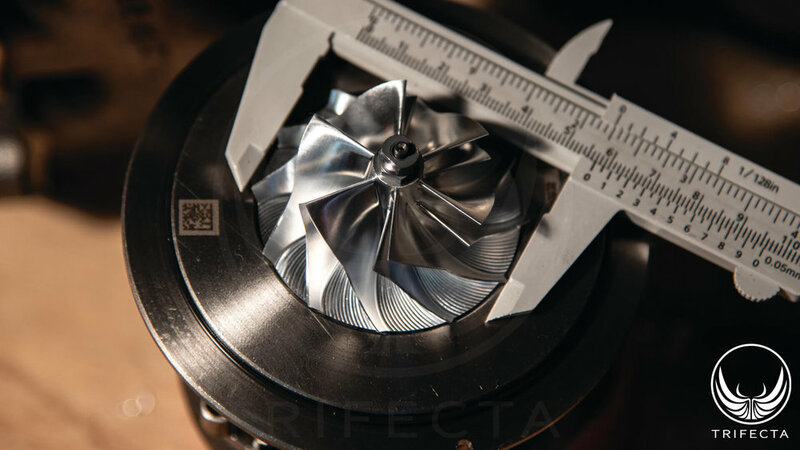 We'd mentioned to several people wondering about our 55mm turbo project that there had been some delays due to a compressor change. It turns out the change was to make the compressor even larger! This will delay the launch of our turbo just a bit longer, we need to calibrate with the larger compressor, but we're expecting better gains over the 55mm turbo! Will this require fueling (like e85 or pump) or water meth upgrades? 91 octane is all that is needed, and in fact the car will run on 87 octane if needed. Power will simply scale down accordingly. The upgrade is going to be 58mm. What was the factory size? When will this upgrade be ready? Thanks, trifecta is awesome! Are you guys working on anything for the Gen2 Cruze 1.4T? Better injectors/bigger turbo would be fantastic! We're still working on this one, so wheel size hasn't been finalized, but it is most definitely in the works! release date for Gen1 1.4T. 58mm? i have a 2018 sonic rs premier that has been waiting patiently for this. Can we preorder the turbo. I am waiting with great anticipation. Have oedered the Racer X intake and currently have an AMS water-meth kit not installed waiting to do the turbo upgrade 1st. @joeker12, we'll be sending out the first kits by or before the end of March, with a firm release date to follow. I would love to be added to the list. I am looking forward to the upgrade.